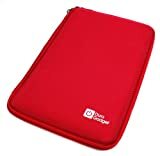 Introducing DURAGADGET’s premium quality hard shell case for your brand new tablet, finished in a bold matte Red! Crafted from tough and durable EVA, the hard exterior of this case offers intense shock and impact resistance – ideal for protecting your valuable tablet whilst on the move. Industrial grade, steel-rimmed dual zip closures line the case for wrap-around device protection and security. The branded toggles are ergonomically designed for fuss-free, no-hassle removal of your device. The interior of the case features a netted compartment for storing your corresponding tablet accessories – Micro SD cards, USB cables or paperwork. A thick elastic strap secures your device into place and the anti-scratch, anti-mark interior ensures you maintain the glossy finish of your HD touchscreen. DIMENSIONS – Height: 265mm x Width: 172mm. Charge your new gadget with this high quality Micro USB data transfer cable. DURAGADGET’s fully retractable cable is protected by exterior casing when not in use for preventing damage to the insulated cord. The retractable function allows for simple and effective storage and transportation. In its compact, lightweight and ultra-portable design, this multi-purpose data sync, transfer and charge cable is an absolute must-have for any tech user. N.B. Please note that purchase of this item is for 1x Retractable Data Cable only and does not include any devices that may have been included in corresponding images. DURAGADGET’s blue and black carry case for your expensive laptop and those all important accessories. The case is water resistant and durable, but remains incredibly lightweight, so is perfect for transporting your laptop and accessories around with you. With extra pockets and compartments, the carry bag is packed with additional storage options and a cushioned memory foam interior safely protects your laptop from knocks and scrapes. A convenient magnetic front pocket with headphone slot designed for your mobile or mp3 player, allows you to use your headphones easily whilst on the move. Maximum protection from dust, scratches and other damaging agents is provided by the strong dual zip closure to offer you peace of mind whilst out and about. The case can be carried using the adjustable shoulder strap or hand straps maximising carrying comfort.